Do not give aspirin to a child aged 18 years of age or younger because of the increased risk of Reye's syndrome. In some cases, a steroid medication is injected into the space around the spinal nerve. Research suggests these injections have a modest effect when irritation is caused by pressure from a herniated, or ruptured disc. 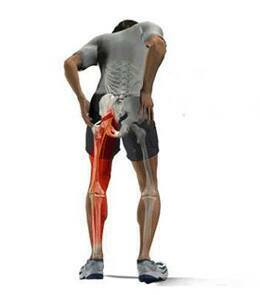 Sciatica pain may make it difficult to be active. But bed rest is not recommended as a mainstay treatment. To manage new sciatica pain, you may find that certain positions and activities are more comfortable than others. If symptoms are not severe but persist beyond a couple of weeks, your doctor may recommend physical therapy. The proper exercises may actually help reduce sciatic pain. They can also provide conditioning to help prevent the pain from coming back. The exercises recommended will depend on what's causing sciatica. It's important to work with a specialist who has experience working with people with sciatica. It's also important to do the exercises exactly as directed. Complementary and Alternative Remedies for Sciatica Pain Relief. Some people find pain relief from complementary and alternative therapies such as biofeedback and acupuncture. Keep in mind, though, that these therapies have not been shown by scientific studies to help sciatica. Biofeedback is a technique that helps make it possible to control bodily processes such as heart rate, blood pressure, and muscle tension. It works by using a machine that provides information about the process being addressed. Having that information displayed, the person is often able to find ways to achieve conscious control of these processes. Probably the most common use of biofeedback is to treat stress and stress-related conditions. Acupuncture is a treatment that uses fine needles inserted at specific locations on the skin called acupuncture points. The points are located along meridians or channels. The channels are thought to conduct Qi, which is said to be the energy or vital force of the body. The theory behind using acupuncture is that pain is thought to result from imbalances or blockages of the flow of Qi. Acupuncture is supposed to remove those blockages to restore the balance. One theory is that stimulating these points produces an effect by stimulating the central nervous system. This, in turn, would trigger the release of chemicals that either alter the experience of pain or produce other changes that promote a sense of well-being. Only a very small percentage of people with sciatica will require surgery. If pain from sciatica persists for at least 6 weeks despite treatment, you may be referred to a specialist. At that point, surgery may be an option. The goal for surgery is to remedy the cause of sciatica. For example, if a herniated disc is putting pressure on the nerve, then surgery to correct the problem may relieve sciatica pain. If sciatica symptoms are severe or become progressively worse, then immediate referral to a specialist is necessary.